Arctic Campion is also known as Arctic Catchfly. This small perennial is a nice addition to a sunny perennial bed. It forms a low mound of deep green, leaves. 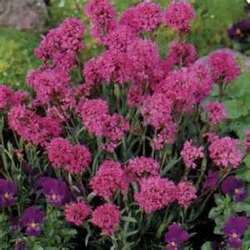 It will bear clusters of tiny deep pink flowers in late spring to early summer. It will grow to a height of 4" to 6" tall and 6" to 8" wide. Use Arctic Campion for edging, growing in rock walls, Alpine Gardens, Cottage Garden, or a Rock Garden. The flowers attract butterflies, is deer resistant and drought tolerant once it is established. Arctic Campion is also great in containers.